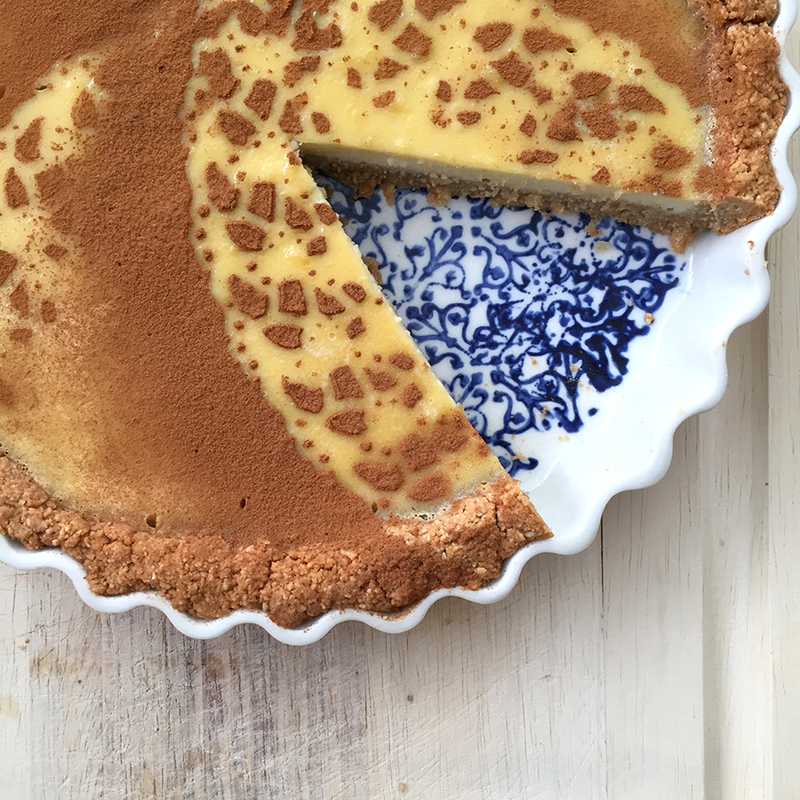 I was introduced to melktert (which means “milk tart” in Afrikaans) on Jamie Oliver’s Instagram. He described the melktert as “naughty” which made me smile and made the idea stick in my head (the photo of his totally gorgeous rendition probably helped with this). That cracked caramel brûlée top! Swoon. ANYWAY. I got to thinking whether a paleo melktert might be possible. 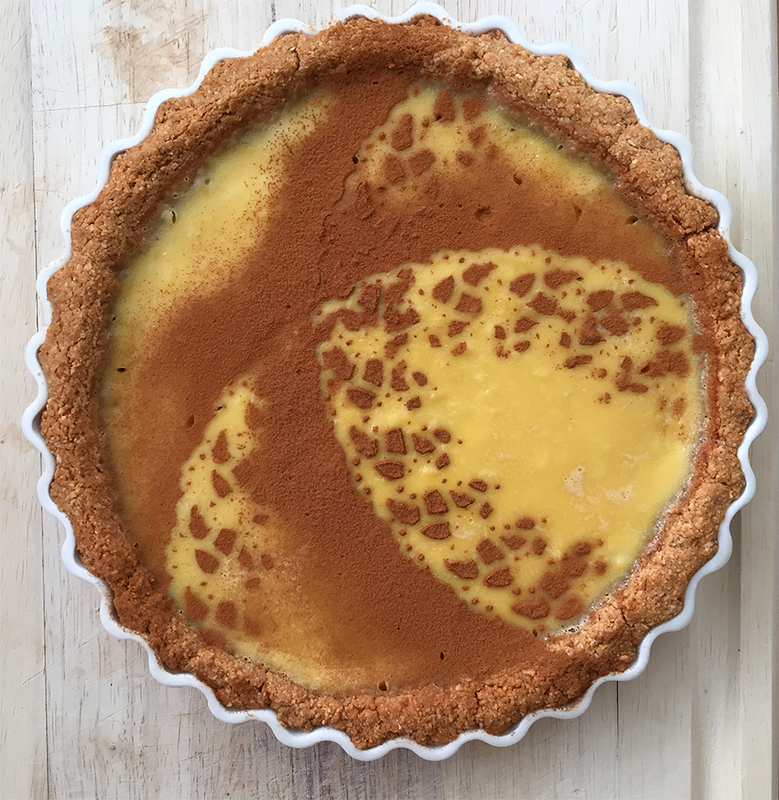 The traditional version of this South African dessert consists of a sweet pastry crust containing a creamy filling made from milk, flour, sugar and eggs. Um, pretty firmly a no-go but I was still really tempted by the idea of a paleo adaptation! The ratio of milk to egg is higher in melktert than in Chinese egg tarts, which I must admit I’m not a fan of. There’s a famousssssss egg tart bakery here in San Francisco’s Chinatown, but when I tried one all I could wonder was “who put sugar in my scrambled eggs?”. So I was curious to try a milkier version of the same idea, if that makes sense. 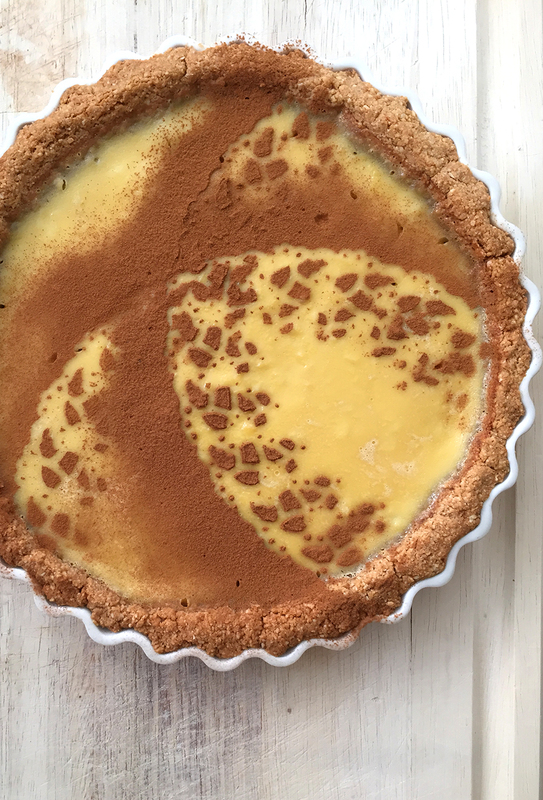 There are plenty of paleo custard recipes out there already, so I chose one and ran with it. Granted, I made it without the flour (even grain-free flour) that the original calls for, so it’s not a very close adaptation. But it’s a delicious one nonetheless, and perfect for those with restless tummies after consuming dairy or grains since this contains neither. P.S. You can buy stencils especially made for stuff like making the design in the cinnamon and coconut sugar, if using. I love this one, or this or a stencil kit! If not, feel free to serve this with a plain top, streak it with melted chocolate or experiment with a caramel brûléed top à la Jamie. Last option is to follow a similar route to what I did (which was using a $1.50 appliqué from the Japanese dollar store down the street as a stencil under a sprinkle of cinnamon). Melktert is a popular South African dessert consisting of a sweet pastry crust containing a creamy filling. This paleo version is dairy free, grain free and refined sugar free for a healthier spin on a classic. Thoroughly grease a pie plate or tart pan (mine is 1" deep and 9.5" wide). Prep your favorite crust, note that the filling needs approximately 30 minutes of baking at 350° F to set. To make the filling, use a hand mixer to whip the eggs, coconut cream and honey together until smooth and thoroughly combined. On medium-low heat, warm the mixture in a pot with the cinnamon sticks, stirring constantly until simmering. Pour into the crust, and bake in the preheated oven for approximately 30 minutes, until set. Remove from the oven, allow to cool to room temperature, then sprinkle the cinnamon over the surface by hand or using a small sieve/strainer. This sounds amazing and surprisingly easy to make!! It looks like some kind of awesome creme brulee tart! I think your version is even prettier than Jamie’s! How impressive- just beautiful & lovely ingredients!! Beautiful! I can’t wait to try this. No WAY! This is gorgeous! Great recipe! This sounds delicious + it’s gorgeous! I always love your photos. So beautiful! Thanks, Emily! I love decorating tarts. What a gorgeous picture! I’ve never heard of this before, but it looks simple and delicious. I’d never heard of it until recently, either. Glad I have now, though! The design on your milktert is really extraordianry. Thanks! I was stressing about getting a cake stencil but then relaxed and just used what I had. I’m glad I did! I’m surprised at how simple the filling recipe is. It looks like something that takes 12 egg yolks lightly tempered and whipped for 3 hours! Gorgeous, pinned!